Whole Foods and Trader Joe's are squeezing the upscale/prepared food market a little tighter according to a Business Journal article this past week. It is reported that Whole Foods may be already eying expansion to an additional location. Is Whole Foods the WalMart of organic? While I appreciate the "buy local" philosophy, I am not a fanatic (I am a Costco member). Yet I continue to resist shopping at either Whole Foods or Trader Joe's - there's just no need. I continue to make at least a weekly stop at Gateway. Gateway Market is one local business I unequivocally support! I'll see you at Gateway at least every Tuesday for "kids eat free" night! Moving the conversation just down the street from Gateway, let's contine the exploration of Ingersoll improvements from last week. 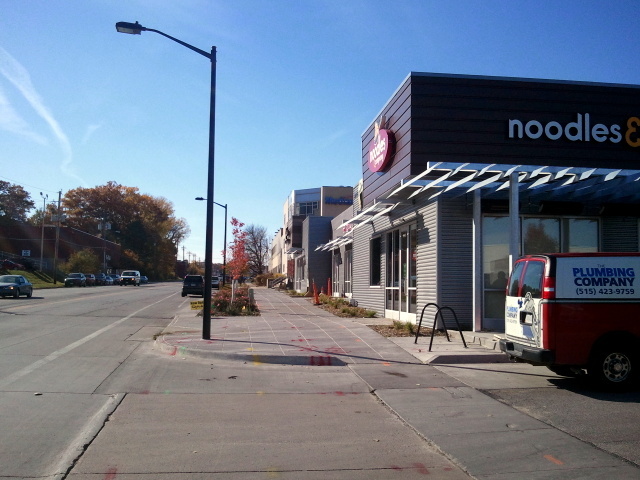 Finishing touches are now being put on the soon-to-be operational storefront retail strip on Ingersoll east of MLK. Compared to the retail strip across MLK, this one is fresh, creative, and engaging - a true presence on Ingersoll. Utilizing contemporary materials such as galvanized steel for the sunshades and corrugated metal cladding, this building capitalizes on the energy a new development in a prominent location can bring to a district. I do worry a bit about how the sheet metal on the "marquee" volumes at the east and west corners of the building will fare over time. On the down side, this prominent corner at Ingersoll and MLK is shaping up to be quite underwhelming in terms of density. With a huge amount of traffic passing by this corner each day, this intersection marks the entrance to the Ingersoll district... it should be built UP, not out. What do we have? A one-story medical building on one corner, an auto repair shop on another, a small restaurant on the third, and a vacant lot on the final one! Corner of MLK and Ingersoll: This one-story medical office is located at the prominent corner of MLK and Ingersoll. This corner is a seriously missed development opportunity. Imagine two or three more floors of apartments on top of the new retail strip. Imagine a strong piece of public art or an interactive fountain at the corner. 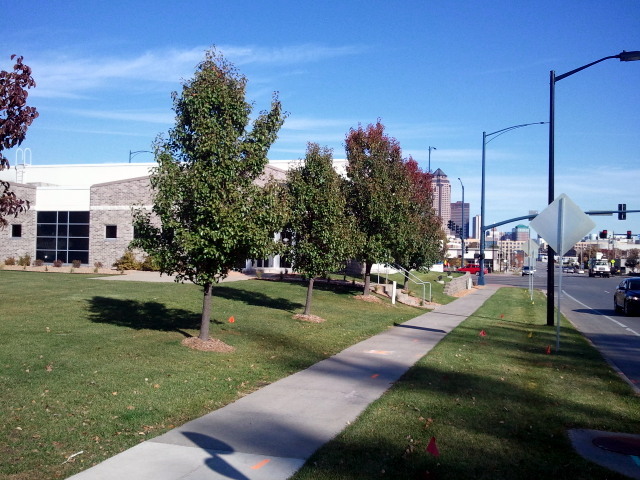 Imagine an entry marker establishing the east entrance to the Ingersoll business district. Imagine a fully established pedestrian/bike connection between Ingersoll and Gray's Lake. With downtown rental apartments at near-capacity, the Ingersoll district represents a perfect outlet for the downtown residential energy. Literally minutes from the Wellmark, Meredith, and Nationwide campuses, this corner has access to public transportation, walkable neighborhoods to the north, Gray's lake to the south, street-level retail, restaurants, and a full-service grocery. According to Cityview, DART is eliminating and/or reducing non-peak service on several routes that serve major nodes. DART is either reducing or outright eliminating non-peak service to several routes throughout the metro starting in November. Among the routes affected are the Nos. 5, 11 and 3, which collectively service the Franklin Avenue library, Drake neighborhood and Merle Hay Mall, as well as any Hoover High School and Meredith Middle School students living on the No. 5 line. Apparently these routes are too expensive. 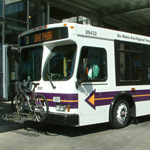 DART is reaffirming its role not to provide public transportation to a broad base, but rather to serve downtown commuters. It's a self-fulfilling prophecy: design a service that doesn't meet people's transportation needs. Then document low ridership and reduce service... Of course it's not that simple, but here's where the rubber meets the road, so to speak. On multiple occasions have I tried to use DART to meet what should be a no-brainer need - getting to and from the AIRPORT. Want to know when DART busses pass the airport? Just about never. Literally... just about never. To get into downtown, your flight has to arrive between 3 and 4 on a Monday through Friday. If your flight arrives at 5 on Friday, you will have to wait at the airport for about 70 hours for the next bus. A couple suggestions: instead of running full-sized buses on routes with smaller ridership, particularly those that run out to the 'burbs, what about half-sized buses? I often see full-sized buses with only a couple riders... Post schedules AT stops so people know when to expect the next bus... and then follow through. Serve nodes that people use - and serve them well. Enhance the "hub and spoke" system with cross-transfers so people don't have to go all the way into town to travel between major destinations. Expand ridership among students by making sure that all upper level public schools are well-connected. I completely agree with your perspective on the new developments at the corner of Ingersoll and MLK. Higher densities that include housing will also serve as an increased market for the many businesses that are currently and could be in the future located along that district. They may have backed out, but Veridian has/had an option on the vacant land at the northeast corner of this intersection, yet another poor use of land for that site as it is likely to be a single-story development. This brings up another question... who is Des Moines' urban mixed-use, urban developer (of new construction)? Hatch does nearly exclusively residential (plus work-live units)... outside of the East village, it appears that the Neighborhood Development Corporation is the only player. Thanks for reading, Aaron. I would look to groups of individual investors to "develop" individual projects for a more organic look and feel. 300 East Grand is not necessarily a model investment vehicle, but certainly an innovative building. On the other side (big developers), there is Hubbell working on Cityville... I fault the city to some degree. Perhaps there should be a form-based overlay zoning district in place for locations like Ingersoll.